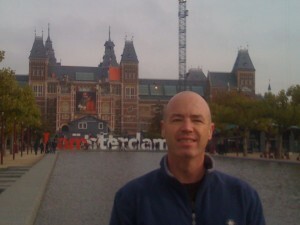 In October of 2010, I had the joy of speaking in Amsterdam at an event known as Sibos. Sibos is the annual global event hosted by SWIFT – a global banking consortium of over 8000 banks. The event ended on Thursday, and I did not fly home until Saturday, which gave me Friday to explore Amsterdam, its museums, its concert halls, its beautiful canals. It was an amazing day. 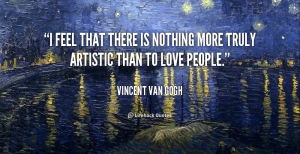 I’ve always known that I shared a birthday, today, March 30th, with Van Gogh. However, that Friday in October almost 6 years ago was completely transformative. I felt as if I were floating through the city as I moved between these spaces. As I celebrate my 51st birthday, today feels like the right day to share this very personal experience in a more public way. As I celebrate my 2nd birthday without my beloved Maureen here by my side, I am becoming more and more comfortable shedding my mask and revealing my core. We only have so many days on this earth. So many days to live. So many days to love. So many days to make a difference. This is who I am. This is my core. This is what drives me. Unlike Van Gogh, my canvas does not include paint. My canvas is people. My art is love. This is who I am. This is my voice. Well, this week in Amsterdam has been quite the journey. It started last Sunday as I rode the train up from Brussels. During the train ride, I still had all of the nervous energy of a schoolchild heading into a test, but I also had the blessing of the story of CLOUD flowing over me as the landscape flowed by us. I can remember vividly riding through Antwerp on the train and feeling my pulse quicken just knowing that my beautiful bride, Maureen, was born in that town. I also felt the rush of memories of my own time in this town, memories that had Maureen and I together, as well as our children. Tears flowed freely, because I was feeling the emotions of these painters speak across the generations. Sitting there on the bench at the Van Gogh, I didn’t just see paintings on the wall. I saw Hardelot, France, where we had visited after the Diercxsens family reunion in Belgium, and remembered the sunset there on the beach in northern France. I saw the beaches of Duinberken with my Maureen in April on our anniversary trip this past spring. As I said in my note to my “brother” and life-long friend from Apple, Tony in an email, all of that emotion was heightened by the sharing of a birthdate with Van Gogh and his ability to paint his canvases through the support of his brother, Theo. 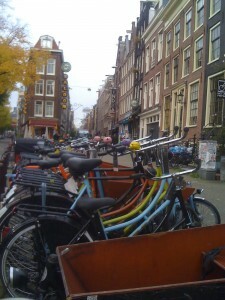 The richness of my day in Amsterdam never slowed down. 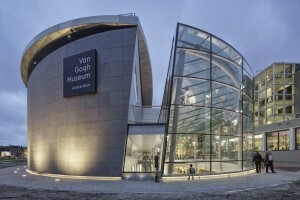 From Van Gogh to the Rijks Museum, it was stunning to experience yet more works of the great masters and then enjoy a lively walk through the streets and by the canals of the city. My pace never slowed, and I enjoyed a refreshing Pellegrino and espresso in a little “Australian” shoppe by one corner, tapping out some work on eHealth topics and watching the passerbys enjoying their Friday afternoon and the start of their weekends. The concert hall was truly beautiful, sitting at the end of a grand park that had the Rijks Museum at one end, the Van Gogh on the far side, and the Concertbegouw on the other end. It was a quick walk to the Concertbegouw from my hotel on a wonderful brisk evening. The two operas from Wagner and Brotak were splendid. The voices of the male and female singers were incredible in both pieces. Their ability to bellow such sonorous tones did for my ears what the paintings throughout the day had done for my eyes. As I think about how Van Gogh brought together his tools of art, and then allowed himself to experience his contemporaries and not fight the ability to change, I feel his life force. After a few years of his first experiments with art, after his evangelism, he still did not know that great gifts were within him, that he would be a great master. But, I know he felt compelled. He felt drawn. Every component of his soul wanted to paint; it was his love. The months in the hospital must have depressed him greatly, because he was pulled away from the very nature he wanted to express. You can see it in the paintings he made there. The trees he painted weren’t just another style, with the starker lines and edges, they were trees seen through the eyes of a sad man. He knew that the physical gifts he needed to keep painting were waning, and that his ability to extract life out of his love for painting would be coming to an end sooner than he desired. He just couldn’t imagine living not doing what he loved. As I look back on these words now, almost 6 years later, this last line really resonates. “He just couldn’t imagine living not doing what he loved.” As I begin my 52nd year on this beautiful earth, I can not imagine a day not doing what I love. None of us should. Find your love. Find your voice. In the words of the song by Yes, “Nine voices. This dialogue. Nine voices. When the sun came up this morning, each had the power of people. Speaking new languages. They give forgiveness meaning. New ways of letting go. Each child is born for greatness, with forces that surround them.” Greatness is indeed our birthright, and I am truly blessed by this life and all those with whom I share it.